The heavens have fascinated people for centuries. Star night at the Coastal Discovery Museum will begin inside with a brief presentation on stars and objects of interest in the winter sky. 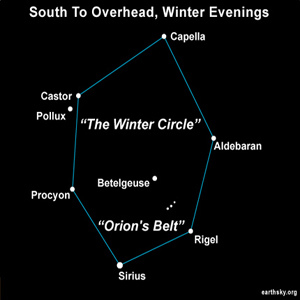 You will then proceed outside to observe and learn how to find the constellations of Winter Hexagon, which includes Orion, Taurus, Gemini, Canis Minor and Auriga. Some of the myths associated with these constellations and others such as the legend of Andromeda will be described. The show must go on, rain or shine. Cost is $12 adult, $7 child (ages 6-12), at the time of this posting. Reservations are required and may be made by calling 843-689-6767. Call them to find out when they are holding their next class. Happy Gazing! Ready for Valentine’s Day? — Looking for that Pot of Gold!